The Deck Alpha Umbilical Hall is a room within Frigate Orpheon. The room is a small hallway that connects the Emergency Evacuation Area and the Map Facility. 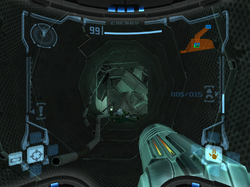 There is a large amount of rubble blocking the hall, but Samus's HUD will prompt her to use her Charge Beam to clear it. There is the body of a dead Space Pirate that was probably killed by the rubble falling on its head. Although this debris is obstructing the hallway, it looks like it can be easily removed. This page was last edited on 3 May 2013, at 02:45.